Last Sunday, we had a small group of family and friends over to our house to officially welcome Maddie home. The girls had a great time because 1) there were lots of people to pay attention to them and play with them 2) they got to open presents, and 3) there was cake. Isabel has been asking for more cake ever since her birthday. She was quite happy to finally get some. Maddie dug in with both hands. First taste of cake perhaps? With each passing day, I believe Madeleine feels more and more comfortable in our home and with us. Today, when she was pooping on the potty, Ibby came bopping in the bathroom and asked her for a kiss. Maddie obliged despite the bad timing on Ibby's part. And then she turned to me and asked ME for a kiss. Now, Maddie has been kissing both Richard and me since day one, and she and Isabel have been smooching ever since they met, but this is the first time she's asked me for a kiss. Usually, we have to do the asking. She spontaneously hugs me all the time. For example, when the girls and I are on the floor playing, Maddie will suddenly run over to me and throw her arms around my neck and give me a good squeeze which, of course, prompts Isabel to do the same. One of the highlights of my days, that. But she usually doesn't offer kisses. She gives them when asked, but up until today, she hasn't been the one to initiate. When I ask her for a kiss at bedtime, when I'm the one putting her to bed instead of Richard...we trade off...I will say after the first one, "Another one?" and "Another one?" and we keep kissing until she starts to giggle or we mutually decide enough is enough. Today, after she asked for that first kiss, she said, "Another one?" and I absolutely melted. Pictures. I know, I know. You want some. 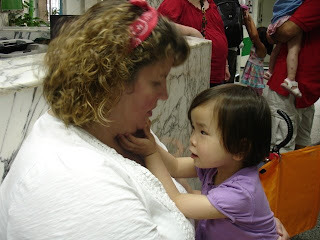 I promise to post some pix of a small Welcome Home gathering we had for Maddie this past Sunday. And I promise to be better at taking pictures of my girls, so I have more to post. Before we left for China, I was worried about everything. I was worried about the trip itself. I was worried about how Madeleine would react to us. I was worried about her physical health and mobility. I was worried we wouldn't sleep for months after getting home. I was worried my two daughters would hate each other, and I'd have to deal with girl fights on a daily basis. I was worried I wouldn't love Maddie as much as I love Isabel or that I wouldn't love her right away. What can I say? I am a worrier. If only I would have known that all my fears were unfounded. Maddie has now been with us for three and a half weeks and home for just twelve days, and honestly, I did not expect to be where we are until months down the line. I figured we wouldn't be leaving the house for awhile so that we could establish a routine. I assumed we wouldn't be able to have people over to meet Maddie because she'd be too frightened of strangers or worse indiscriminately affectionate. I surmised that we wouldn't be eating in a restaurant for awhile or going on playdates. We've done all those things and more. I cannot believe how seamlessly Maddie has transitioned into our family. What a remarkable, resilient girl. To what can I attribute her easy transition? Probably a combination of factors...certainly her personality and temperment, definitely the care and love that she received in her orphanage, the fact that she came from such a small orphanage played no small part, possibly her age, having a sister to bond to especially when she was so close to one other child her age at the SWI, the two weeks Richard and I had to focus on her alone...all these factors combined have certainly made a difference. Oh, and don't forget the divine intervention. There had to be some of that. There are moments when I watch Ibby and Maddie chasing each other around the house or when I hear them screaming and giggling when they're playing with Daddy or when the two of them will sit in my lap for a story, and this complete sense of joy washes over me. Truly, I didn't think life could get much better, but it has. We're not kidding ourselves that Maddie is completely bonded to us already, but we are certain that she feels safe and secure and happy, and that's a good start. The only issue with which we're dealing regards food. She is not a hoarder. It's just that she could eat all day long, so we're trying to draw a balance between making sure she knows that she will always have enough food but also trying to transition her to a meal and snack schedule. It's been tricky, but the last couple of days have been much better. Oh, and one more thing. Maddie does not let us know when she's awake. I supposed she is used to being placed in her crib and just waiting until someone came to get her. We just have to keep checking on her in the morning and after naptime to see when she awakens. As for her limb deficiency, she gets around amazingly well...even outside...though we did buy some knee pads for her to provide some cushioning when we're outside on hard surfaces. Maddie has been accepted by Shriners Hospital in Minneapolis, and we will have our first appointment with a pediatric orthopedic specialist on August 31. 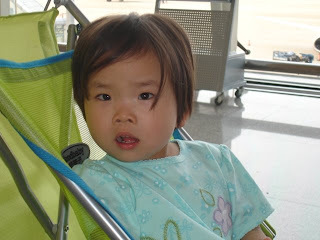 At that point, we'll know more about her prognosis and our options. I don't see how they can do anything but amputate, but we'll see what the doctor has to say. I'll admit that we've been so busy that I am not taking nearly as many pictures as I should but here are a few that highlight the personality of our newest girl. Maddie loves to wear sunglasses...even indoors! Ugly bench left by former owner of our house...who knew it would become a seating area for Maddie? Daddy and his girls...shortly after Isabel stopped crying after hitting her head on the bench. I'm not going to lie. I'm exhausted, but I think that has more to do with a delayed case of jet lag than it does to having two toddlers toddling around the house. Plus, I picked up a little cold somewhere, so I'm not feeling the greatest. That said, I am still having the time of my life observing Ibby and Maddie get to know each other. Each of them is trying her hardest, and I am so proud of them. Ibby is a little possessive at times, of her toys and of Mommy and Daddy, but that's understandable. For the most part, she's been really good about sharing. She did speak her first three word sentence yesterday. Too bad it was, "No! My mommy!" directed at Maddie, of course. Normally a fabulous sleeper, she has had a bit of trouble lately. The first night home, we had to go into her room five times after we put her down to assure her that Mommy and Daddy would be there in the morning when she woke up. Last night, we only had to go in three times, but then she was up during the night. I think the night wakings had more to do with the fact that she has picked up my cold. Hopefully, after a bit more time passes, she will feel more comfortable that Mommy and Daddy aren't going anywhere, and she'll be back to sleeping well. It's funny. Naps have not been an issue...just night time. Madeleine is doing really, really well. She is a great playmate for Isabel. Obviously, she learned the art of sharing in the orphanage. She is so sweet. She continues to mimic everything she hears including the "sh*t" Mommy uttered when she was trying to put together the Little People Castle. Oops. I'll have to watch that. She has almost learned the entire ABC song just by listening to the Leap Frog Alphabet Pal sing it...over and over and over. She had a bout of grumpiness yesterday which I am going to attribute to jet lag as well. She had been napping for three hours when I decided to get her up, and she just wasn't happy about that at all. When Daddy got home, it turned into a bout of crying, but thankfully, it didn't last long. She was happy and playing after about 15 minutes, and she had a ball in the bath with her sister. The nice thing about two kids so close in age is that they are on the same schedule which makes life so much easier for me. Nap time is glorious, I must admit, but really, I couldn't have asked for things to go any more smoothly. We are blessed beyond measure. The bags are unpacked. The laundry is done. And the house is clean. Now all we have to do is go to the grocery store, and we'll be all set. Travel home was a breeze. I'm not kidding. In 24 hours, Maddie maybe did a total of 20 minutes of whining and NO crying. Really. She was a stellar traveler. The worst part of the journey was the five hour layover in LA waiting for our Minneapolis flight. 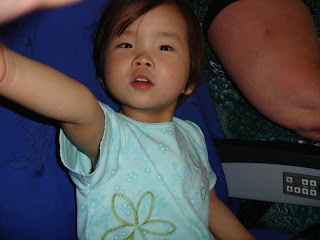 As for the flights themselves, Madeleine slept about nine hours on the way from Guangzhou to LA and almost the whole time from LA to Minneapolis. Going through immigration in LA was interesting because they had no idea what an IH3 visa is. It used to be called an IR3 visa; that's the classification Isabel got when we brought her home, and it means that the individual entering the country becomes an immediate citizen. Now, when adopting through the Hague guidelines, the visa is called an IH3. It's still pretty new. Thankfully, there was somebody who knew what the classification meant, and so after a short delay, we were on our way. Aunt Sue picked us up at the airport (thanks for getting up so early on a Saturday, Suzy Q), and after a quick stop at Grandma Sandy's, where Maddie showed off all her new English phrases, we were headed for home. 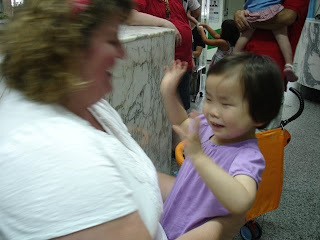 Our dear friend Joann, who was going to go with us to China when we planned on taking Isabel, had picked up Ibby from Wisconsin on Friday and stayed with her at our house, so she would be there when we arrived. We were so anxious to see her! When we finally got to our house, after another quick stop at Starbucks (neither of us had slept as much as Maddie), I went in first. Our alarm beeps three times when any door in the house opens, so as soon as she heard that, Isabel knew someone was there. She hollered out, "Daddy!" because that's usually what the three beeps mean...that Daddy's home from work. But then I appeared at the bottom of the stairs. She was up top, looking down, and when she saw me, she said, "Mama!" I ran up and grabbed my girl, and she just clung to me, saying, "Mama! Mama!" It brought tears to my eyes. After a couple of minutes, Daddy came up with Maddie. And then Daddy got a big hug. She wasn't too sure about Maddie at first. And Maddie didn't really take much note of Isabel because she was far more interested in the toys and the cats. Every time she'd see one of the cats for the first several hours, she'd say, "Meow! Meow!" 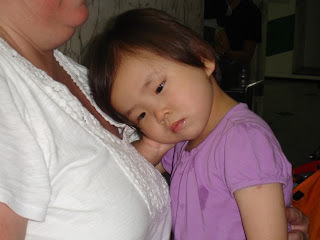 For the first few hours after we arrived, Isabel didn't want either one of us to leave her sight. She would start to cry whenever one of us walked out of the room. In fact, when Richard went outside to unload the car, we had to watch out the window to make sure he wasn't going anywhere. 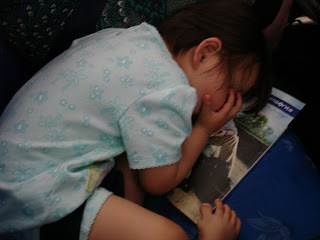 Today, she's much better, but she's still clinging pretty tight to both of us, and she didn't go right down at bedtime. She needed us to come in about five times before she realized we weren't going anywhere, and it was safe to go to sleep. And Madeleine? She slept all night long in her own room in her big girl bed without a peep until this morning when she had to la shee shee. Maddie acts like she's lived here her whole life. She goes up and down stairs easily. And Isabel has begun to show her the ropes. For instance, when Maddie started pressing buttons on the dishwasher, Isabel told her, "No, no!" The two of them have gotten along better than we could have ever hoped. Isabel was a little shy at first, but in less than 24 hours, they've been giggling together, sharing toys, holding hands in the car, and giving each other kisses. They took a bath together last night and had a grand time. It's almost like Ibby can't believe Maddie is real. She keeps touching her head and saying, "Maddie," like she's trying to reconcile the fact that the little girl she's been looking at in a picture is a real live human being. Maddie is the big sister, but she is taking her cues from Isabel. She follows her everywhere, and often imitates what she does and says. It's going to take a little time for them both to completely adjust to their new lives, but I think we've had a smashing start. Here are a few pics of my two girls together for the first time. We are Outta Here! Well, almost anyway. This morning we did a little last minute shopping at a couple of the shops close to the hotel, A Gift from China and Sherry's. We also picked up a suitcase at our favorite store, Jordon's, to carry home all our purchases. Then, we stopped at Starbucks and sat outside while we drank hot coffee. It wasn't so bad because the humidity was down a bit, and it would be a few more hours before the heat index reached 110 degrees. When we got back to the hotel, we got our suits on and hit the pool. Madeleine LOVED it! I got a few contraband photos before the lifeguard told me I couldn't take pictures. Oops. After lunch and an early, short nap, we met up with the other families in our travel group and boarded a bus bound for the US Consulate. I'm quite sure we had a bus with faulty or nonexistent shocks because I was a little queasy after the 30 minute drive. Up on the 5th floor, we passed through a metal detector, had someone check photocopies of our passports to make sure our real faces matched our pictures, and all stood and swore an oath together that everything we had written in our applications was the truth and nothing but the truth. Then we received our immigration papers, and it was back on the bus. Very easy. Very anticlimactic. But at this point in the process, the lack of drama was much appreciated. We decided to give Lucy's another try for our last dinner in China, and we were pleasantly surprised this time around. We both had pasta dishes which were very, very good. Being the all American girl (well, almost) Maddie had a grilled cheese sandwich and fries. On Friday, we have to hang out until 6:00 p.m. at which time we will be off to the airport for the first leg of our journey back home. HOME! What a glorious word. We will have to do a thorough examination our of room before we check out because Maddie likes to take papers, books, granola bars, whatever she can find and stow them in all the drawers and cupboards. When we depart Guangzhou on Friday night at 9:00 p.m. (China time), it will be a mere 24 hours before we walk in our front door, and THAT will be the second best part of the trip, the first, of course, being the day we held Maddie in our arms. So Schoens out. We'll catch you when we're back on our side of the world. The heat index was 108 degrees today, so we stayed inside in the air conditioning. After a couple of hours in the playroom after breakfast, we came back to the room as directed by our guide, Kelly, who went to the Consulate to make sure all of our paperwork was in order for the US side of things. She wanted us to be near a phone in case there were any issues or questions. Thankfully, all of our documents passed inspection, so when we visit the Consulate tomorrow, it's really just a formality. It seems like it should be a given at this point, but that is not necessarily the case. Kelly told us about one family whose Consulate appointment was scheduled for July 1 and are still in country because the US is being very picky about some of the wording in their home study and how it corresponds to the wording contained in their US Immigration approval papers. It's so frustrating that a family could make it this far and then be held up by their own government. This afternoon, our travel group, nine families including ourselves, met in order to take the traditional red couch photos. There are actually several red couches in the lounge area, and it is customary for travel groups to pose their kids together on one of the couches for a group photo. It's mostly chaos, kind of like trying to herd cats, with some kids crying, some kids trying to get off the couch, some kids looking away, and maybe one or two actually looking at the photographer and smiling. Maddie sat very calmly through all the hoopla, and I think we may actually have gotten one or two good photos of the whole crew. We haven't had an opportunity to go swimming yet, so that's on the agenda for tomorrow morning. We head to the Consulate tomorrow afternoon at which point all official business will be concluded. Several of the families in our group are on their way home tomorrow. We have to wait around until Friday night before we catch our flight to LA. Now that we are near the end of our journey, it seems like the past two weeks have gone fast, yet it still feels like we have been away from home, and more importantly Isabel, forEVER. I don't understand the purpose of having to stay so long in Guangzhou, but then again, I guess there is a lot about international adoption that escapes my reasoning. All I know is that we are so very thankful to have been blessed with another wonderful daughter, and we cannot wait to get her home to meet her sister. We'll do our best to post some pool photos tomorrow. After that, the next you will hear from us is when we are home sweet HOME! Melissa, if you are reading this, you are on my mind! Safe travels to you. I cannot wait to follow your journey! It won't be long now before Darby is in your arms forever. Still no flooding and no rioting so I think we'll make it a couple more days. Unsure of how much of the Chinese news reaches the States, we have been somewhat remiss in posting our status considering recent events. There have been some outbreaks of violence in certain areas and major flooding in southern China. None of this has touched us, thankfully. We heard from one of the shop owners near the White Swan Hotel last night that some flooding was possible where we are, but this morning, all is fine. Yesterday was a major shopping day. This morning we are headed out to Yuexiu Park which should be loads of fun considering it's about a hundred degrees with two hundred percent humidity today. Oh, and the sun is out. More sweating definitely on the agenda. Maddie opens up more and more each day. She is definitely the little singer. 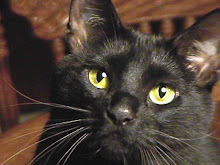 She is very affectionate, giving us hugs and kisses without being asked, and she continues to eat and sleep well. As for food, honestly, I don't know where she puts it. I am quite sure, given the chance, she could polish off an entire watermelon on her own. I know you want more pictures. I promise to post photos this afternoon. Watch this 30 second video and if you watch it 7 more times in a row you'll imagine how we were laughing as she sang along with this signing time video. First of all, Happy 4th of July! We are so missing being in Columbus for the festivities, but we keep thinking about how fun it will be next year when we have two three year olds to take to the parade and carnival and fireworks. Is anybody missing my tuna noodle salad? On Friday, we spent the day at our hotel, playing with Maddie and getting packed. 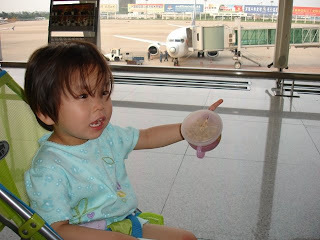 At 4:00 p.m, we headed to the Hangzhou airport, and thus began our second longest day here. After arriving at the airport at 5, we got through security fairly quickly, and then just had to sit back and wait for our 6:30 flight. We boarded on time but then ended up sitting on the tarmac for an hour before we were able to take off due to bad weather conditions in Guangzhou. The flight is only an hour and a half, but we had to circle for another half an hour while we waited for clearance to land. Finally, the plane set down at 9:30. Madeleine was a star traveler. She wasn't scared at all which I sort of thought she might be considering this was her first experience with airports and airplanes. And once again, we didn't see one ounce of fussiness. 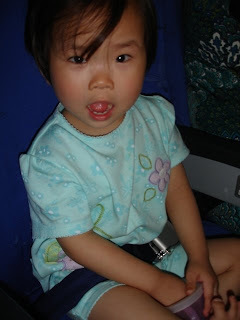 She sat in her airplane seat, belted in, for the duration of the trip and never complained. At one point, she folded herself in half (she's quite flexible, our girl) and fell sound asleep. After retrieving our baggage and boarding a bus with seven other Great Wall families who have joined us here in GZ, it was a 40 minute drive to the famed White Swan Hotel. We arrived around midnight. And still, our girl was happy and smiling. Several cinnamon fish crackers helped. We all fell into bed around 12:30 and had a relatively quiet night. Maddie woke up twice. Once Richard just rubbed her back and she fell back to sleep. The second time we brought her to bed with us, and she went right back to sleep. I think it was a combination of being overtired and being in a different environment. Tonight should be better. We slept in until 8:00 and had breakfast at the hotel. What food ISN'T on the breakfast buffet at the White Swan? Holy smokes. Tired of noodles and rice, all three of us went with classic American fare...scrambled eggs and bacon. Yum. The rest of the morning wasn't so pleasant, but Maddie was a real trooper through it all. Today was the day of the dreaded medical exam. The exam itself is cursory...a quick look in the eyes and ears and mouth, measurements, and a quick listen to the heart. Maddie weighs 25.7 pounds and is 36 inches tall and was declared healthy. 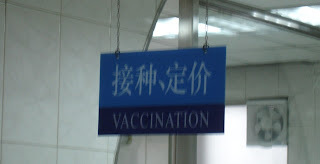 Three doctors did come in and look at her deficient leg and talk about it in Chinese, but we, of course, were not privy to the gist of their conversation since we have not been able to pick up much of the language. We're pretty much limited to ni hao (hello, how are you) and xie xie (thank you). Oh, and la shee shee, of course. The unpleasant part of the exam was the three shots and TB test Maddie had to undergo, an American requirement. I'll give the nurses credit, they did all the pokes as quickly as possible. For her part, of course, Maddie cried, but once we were all done and left the room, she was calm. We're back at the hotel now, and Maddie is in the second hour of what I'm guessing will be a three hour nap. After she awakens, we are going to head down to the playroom. I'm quite sure she's tired of the few toys we've brought, and it will be fun to see her have a whole room full of toys and other kids to play with. The kid continues to amaze us. We are having fun listening to her repeat everything we say. Her catch phrases today have been, "How are you?" and "I'm fine. Thank you." Her pronunciation is as clear as a bell. Enjoy your holiday, everyone. We are happy to be in Guangzhou, knowing that we are on the downhill side of the trip. Despite having an amazing time, we are missing Ibby so much, and we are convinced the cats probably think we are never coming home.